Many of our readers are aware that Texarkana has a Rotary Club called the Oaklawn Rotary Club of Texarkana. They meet weekly, complete charity work, host luncheons, and invite guests to speak. It just so happens that I visited the group a few months ago and was blessed with the opportunity to speak at today’s lunch meeting. My topic was community journalism and how it is affecting our future. I arrived at the meeting early, set up a slideshow and waited. Fortunately, I was the last person to speak or have anything to do in today’s meeting. This placement in the schedule afforded me the opportunity to watch the club in action. Within a few minutes the Texas Middle School Choir arrived. The young ladies and their director had completed a competition recently that permitted each student to sing solos. The Rotary event would be their first event to perform as a group. 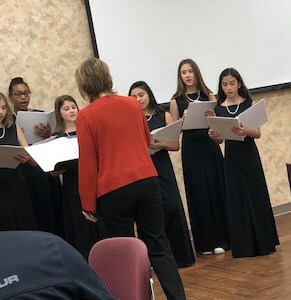 The choir was made up of seventh and eighth graders dressed in black and carrying their music to the front of the room. I considered momentarily how nervous I would have been to be singing in front of a group as a group for the first time but quickly noticed these girls were not nervous. The group and their director had confidence and from the first note to the last, it was obvious why they had that confidence. The performance was amazing. Each note was perfectly pitched to the Rotary group by voices that, though they had not performed together, could have easily competed with a well-trained adult choir. I did not get the name of their director, but I would highly encourage anyone to seek out these young ladies for any event in need of musical support. Later in the program, Outstanding Student Awards were presented by the Rotarians to two Texas Middle School Students. Out of about 514 students, these two students had stood out academically and with positive teacher recommendations. A short bio background was given on each student just prior to the award. It was clear that not only were the Rotarians proud to be able to provide the awards, but the students and their groups were beaming with pride too. Various other topics were discussed by the group including fundraisers, social events, and community work. It was obvious that this club is not going to sit on the sidelines and not be involved in the community. When my time to speak came, I must admit being a little nervous after following the choir, the discussions, and the award ceremony for the students. Somehow, my topic of community journalism did not seem as important or as needed as those other areas had been. Nonetheless, the Rotarians listened, watched the slides, and seemed interested in the material presented. Once I finished, the group even had a few questions and insights to provide. I was made to feel welcome and appreciated by each member present. I learned a lot about the Oaklawn Rotary Club today. I had heard good things about these Rotarians from other cities and areas, but I had never had the opportunity really interact like I did today. I would highly recommend that members of our community reach out, offer to help and support this group of community members. I should also point out that I learned that the Oaklawn Rotary Club is about to host their annual fundraiser.